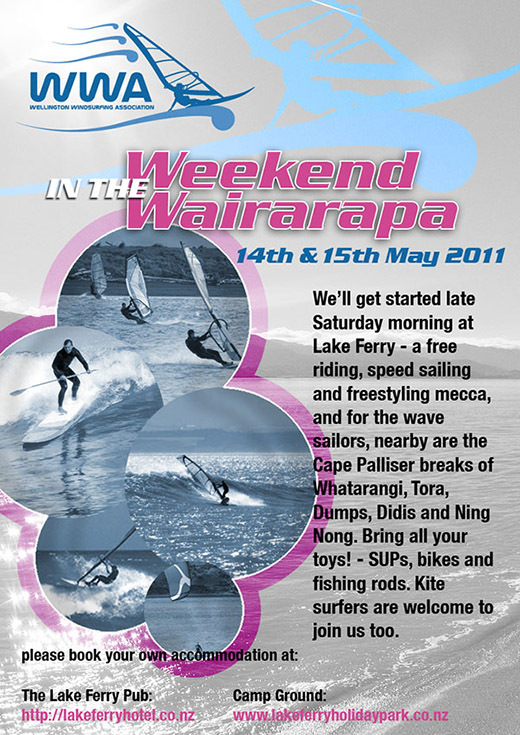 Coming up is our 2011 Wairarapa weekend on 14th-15th May, so fingers crossed for some better weather. From mid-morning Saturday we'll be based at Lake Ferry - a great freeride, speed and freestyle spot, plus there are the numerous Cape Palliser breaks for wavesailing nearby too. Please book your own accommodation at the Lake Ferry Hotel, or at the camping ground. We'll have a few drinks and a meal at the Hotel on Saturday night so hope you can join us for that (register here so we can give the hotel a heads up on numbers). Should be a fun weekend, hope to see you there! We didn't have a lot of luck with conditions for the Harbour Blast recently, but thanks to everyone who registered to sail, and also to our volunteers who were ready to help out. We are owed some wind for the 2012 event!